North of Union the bank became briefly a cliff. (In the panoramic photograph ca. 1881  this section is darkened by its greenbelt. Although steep it can still support trees. In a detail from 1887 the cliff north of Union is exposed. ) A short distance north at Pike, the hillside was again not so steep, and beginning with the Coal Railroad’s incline in 1871 there have been a number of different hill climbs built at Pike. North of Pike near Virginia Street the bluff began to again define itself, and north from there it grew and reached a somewhat dangerous height approaching seventy feet at Lenora Street. This was both railroad land and a squatter’s milieu – as we will again note in detail below. Two or three steep stairways that resembled ladders climbed the bank in this section, making it possible for the agile to pass between the beachcomber’s community on the shore and the shantytown on the ledge above them. It was a both challenging and engaging place to live – and cheap too. North from between Lenora and Blanchard the elevation of the bank descended and again petered out before it reached Broad Street. Just north of Broad there was a small cove (the site of the Olympic Sculpture Garden). It was bordered by a new but modest bluff that continued with a few small dips north to Queen Anne Hill. There the terrain suddenly ascended to the forest that was dedicated in 1887 as Seattle’s second public park, Kinnear Park. As already hinted two ravines – one small and one big – cut through this central waterfront bank, and both played special parts in Indian life before and after the settlers arrived to both name and claim them. These ravines are now lost – filled-in and covered. The smaller one was at Seneca Street. In This City of Ours, a book of historical Seattle trivia written in the 1930s for the Seattle School District, J. Willis Sayers, the author, advised students that while out on a walking tour of First Avenue they should “stop a moment at Seneca Street. This crossing, in early days, was a bridge; under it was a ravine through which passed all the travel from this section of the beach to Second Avenue.” It is curious that the aging Sayers, who was himself nearly a pioneer, did not note that just above the waterfront at Seneca there was also an Indian burial ground. It should be noted that while A. Denny-Lindsey does not mention the ravine, she does put a rather elaborate burial grounds both at the “foot of Seneca” and “on the bluff”, not that there is a contradiction in her description, only some confusion. It is easiest to think of her graveyard as “on the bluff” and so really above the waterfront foot of Seneca. And yet the ravine would have considerably increased the footage available for anything including graves. And she does also make note that “the banks would cave away” from the gravesite. But when this sizeable funerary ground is mixed with Sayer’s pioneer throughway, a bridge, and the spring that another source describes as sometimes irrigating the ravine (and surely through time forming it), it is difficult to know where to put it all. Certainly a mix of exposed graves, overturned canoes, spring freshets and tramping pedestrians would be messy in the extreme. When the “hollow trunks of large cedar trees” is figured in it seems likely that the daughter of David and Louisa Denny is making something of an inventory of gravesites scattered along the ridge. There certainly were other graves on the ridge besides those beside the Seneca ravine. For instance, during an early grading of First Avenue in 1876 a little ways north of Marion Street, according to David Buerge, an expert on the region’s native culture, “a half-mummified body in a stone cyst tomb beneath a five-foot high grave mound” was uncovered. Native American bones were also uncovered during the Port of Seattle work on the Bell Street Harbor in the late 1990s although, as we will explain below, it is more likely that they were not buried there but rather carried there during an earlier development. 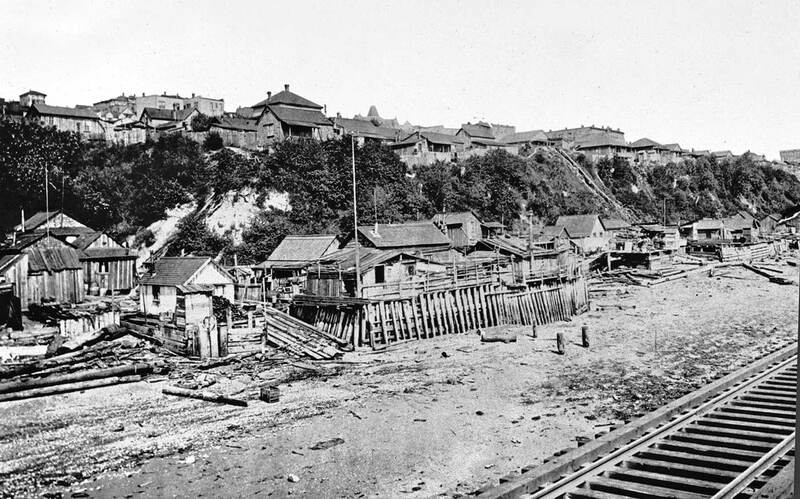 Two partial views of the entrance to the Belltown Ravine were recorded from the offshore railroad trestle. 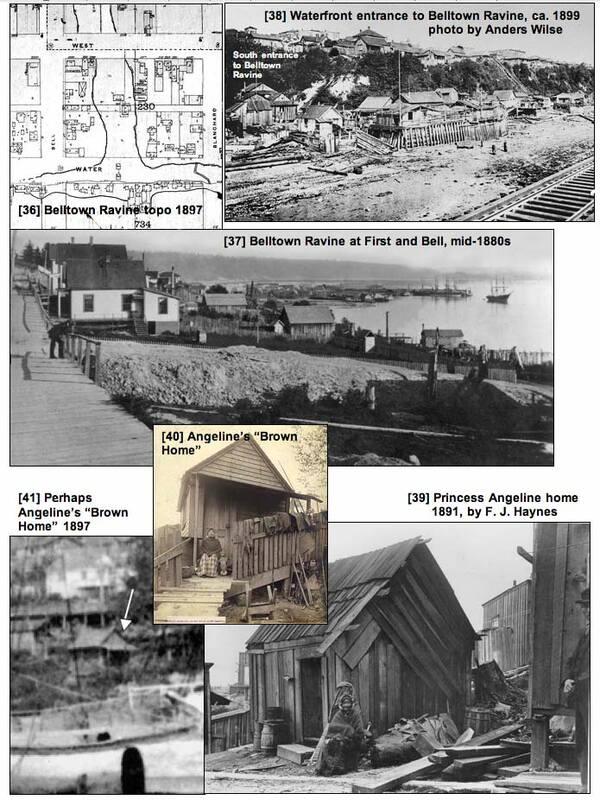 Both show the community of squatters shacks nestled between a jerry-rigged seawall and the opening. (We will show the earlier view here and attach the later view, no. 212, in the “image stream” below.) The earliest view dates from the late 1890s and includes part of the bank that runs south from the ravine. The beginning of the south side of the ravine – the corner where the bank turns east into the ravine – shows on the far left of the photograph by the Norwegian photographer Andres Wilse. The second intimate view dates from about 1902 or 3 and looks over the same community of shacks, but in the opposite direction. Other photographs from the water and also from West Seattle are obscured at the ravine’s lowest elevation where it meets the bay behind the railroad trestle. 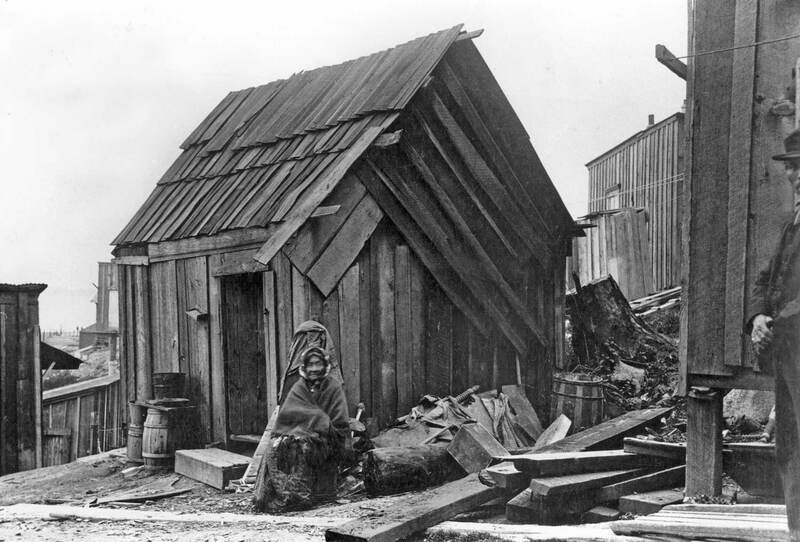 The ingenious cluster of squatters’ shacks at the entrance was moved in 1903 with the beginning construction on the north portal to the railroad tunnel. At first, this did not change life deeper within the ravine. 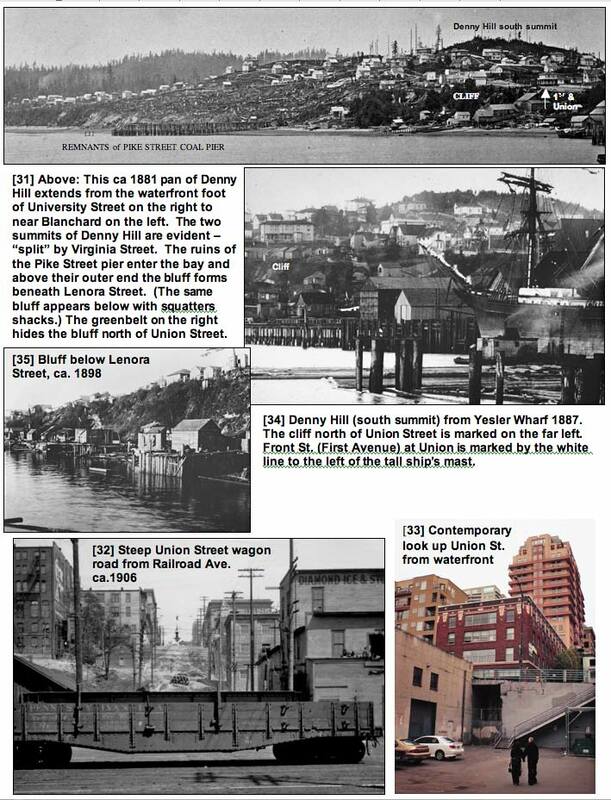 But soon during the various stages of the Denny Regrade the ravine was filled until it was closed off at its entrance with the 1912-14 extension of Elliott Avenue between Bell and Lenora Streets. The human remains that were found during excavations for the Port of Seattle’s Bell Street project in 1998 were probably carried there in the fill that was used to extend Elliott Avenue across the opening of the ravine. What do you think Bertha has run into? A train or a old ship. I would be interested to know. Love reading your articles each week.